We all have a role in keeping our school safe for students. If you overhear something concerning, notice strange behaviors, or see an alarming post on social media - speak up. Please encourage your children to share any concerns they may have with a school staff member, the local police or any adult. Look for the new “See Something, Say Something” button on our website homepage that will allow you to report any concerns. Congrats to the gymnastics team on their first-ever state title! The Ponies edged out defending state champions Lakeview North with a score of 150.250. Read more. The boys swim and dive team captured the 4AA section championship! They will compete at the state meet next weekend. For the Ponies, it's all about teamwork and this season especially it's about looking out for one another and learning life lessons beyond the pool. Read more in the Pioneer Press. Jessie Diggins (Class of 2010) made Olympic history with the first medal ever in U.S. women's cross-country skiing! She was also chosen by her fellow Olympians to carry the American flag in Sunday’s closing ceremony. Watch and hear from Diggins and her teammate as they captured the Gold in a dramatic photo finish. Photo: @JessieDiggins. As you’ve likely heard on the news, the flu is hitting Minnesotans hard. We have had confirmed cases of students testing positive for influenza in schools across the district. If your child is showing signs of illness, please keep them home. Learn more. When reporting your child absent via Skyward or the absence hotline, please notify us of any symptoms your child is having (fever, cough, sore throat, etc.) and if they have tested positive for influenza. This will allow us to track the number of cases per classroom and school. Remember, it’s not too late to get a flu shot! Middle school students are talking about healthy relationships. 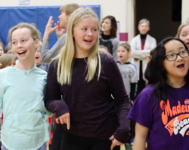 Check out this short video, created by our own students, to learn how parents can help children learn to respect themselves and others while establishing healthy boundaries. A celebration of diversity was held this week at Stillwater Area High School with speakers, discussions, performances and even a heritage fashion show! 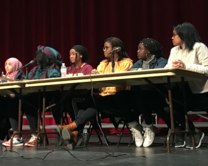 The Black Student Union held a Q&A panel where they discussed what it feels like to be an African American student at SAHS. Students also heard from a variety of diversity speakers, including a Hmong refugee and documentary filmmaker, locally elected female politicians who discussed the challenges facing women, and a University of Minnesota professor who spoke about the future of education. Read more. Geography teacher Sara Damon recently received photos from South Sudan of the well funded with last year's H2O for Life - Water for South Sudan efforts at Stillwater Junior High. From 2009 to 2017 students and the community have raised more than $80,000 and funded nine wells. It is estimated that each well provides water for about 400 people for 20 years. What a legacy our students are leaving! Rutherford students are sending a special message of support to students in Kenya, Africa. Kids on both continents have shared cultural exchanges through Skype connections. When Rutherford students found out their friends couldn’t Skype because the power had been taken away by the Kenyan government they decided to raise money to help restore internet service. They also recorded the song “Count on Me” by Bruno Mars to send to them. Watch the video. Fifth graders at Andersen Elementary donated $350 to Pennies for Patients. The students earned the money from tips given when they worked at Leo's Grill & Malt Shop last fall and through a student council movie night this winter. The donation will go to the University of Minnesota and Mayo Clinic to help doctors and researchers find a cure for blood cancers. Current kindergartners will NOT have school on Friday, March 2. Teachers and staff will be welcoming incoming students for Kindergarten Orientation. Letters were mailed to families with complete details. If you have a child who will be entering Kindergarten this fall (August 2018) but have not enrolled yet, please contact the Enrollment Office at 651-351-8412. Stillwater Area High School is hosting a College Fair on Tuesday, March 13, from 5-7 p.m. in the main gym. This free event provides families an opportunity to meet with representatives from approximately 125 regional and Midwest colleges (two and four year), professional schools and military organizations. For a list of attendees visit our website. The school board will hold a work session for the purpose of gathering information on start times on Thursday, March 8, 2018 from 4:30 – 5:30 p.m. at Stillwater City Hall. See the official meting notice online.